Hermosa Seeds was founded in 2016 on the principles of conscious business, committed to operating sustainably & transparently. Is to empower and heal all people through the development and dissemination of consistent and stable cannabis genetics and cannabis education of the highest quality and affordability. All people having the knowledge, skills, and confidence to sustainably grow their own high-quality medicine. As good stewards of the plant ourselves, we believe all people have the potential to be good stewards alongside us. As a personal preference, we don’t like contaminants in our medicine. We boldly assume that you don’t like any amounts of them in your medicine either. That’s why we opt-out of using harmful chemical pesticides and fertilizers and opt for the organic practices instead, just as nature intended. Can you say: “bat guano“? While we have a deep appreciation for Genetic Diversity (see below), we also think it’s more than fair to have certain expectations of an established strain, which we realize is not always the norm out there. It’s part of our mission to offer you stable genetics that can lead to the highest bioavailability of the cannabis plant’s therapeutic compounds that you’ve come to know and love. You don’t like it when your seeds don’t pop. Neither do we. We are 100% obsessed (OK, maybe not literally) with your 100% seed germination rate. Before offering our seeds to the people, we sample each lot. If the sample of seeds doesn’t 100% germinate, we put a hold on the whole lot for further inspection. Thankfully, we’ve been passing with flying colors. Woo hoo! Of course, you want to know your medicine. And we want you to know, too. That’s why, before we release a new strain, we take the seed all the way to flower and have it tested at SC Labs for full cannabinoid potency and terpene profiles. You don’t like feeling completely alone on your journey. You’re not alone. We believe that the Universe is a friendly place. And that it’s a very supportive one. We also believe, even if you don’t grow Hermosa Seeds (but we really love it when you do! ), that you have everything you need to grow and to medicate and to heal all on your own. And just in case you need some of that Universal support, we are here to give you the guidance you need to succeed. And that education and empowerment are a couple of the biggest keys to attaining Peace. That’s why one of our highest priorities is Giving to sustainable agriculture. When you support sustainable agriculture, you support the use of farming techniques that are pro-planet, pro-health, pro-human, and pro-animal. Why Seeds in the First Place? You’re Off to a Clean Start. Your success could be up to 80% determined by the cleanliness of your grow environment. Like many of us who’ve grown clones, you might have noticed a significant drop in vigor or potency. While the mysteries of this phenomenon are still being unlocked; be it infection, infestation, stress (the act of cloning is a stressful one), or some unfortunate other reason; you can rest assured, growing from seeds is more sanitary, so you lessen the risk of introducing mold, bacteria, viruses or insects into your grow. Growing from seed, you avoid having to dip your plants in neem oil or use other organic solutions or harmful pesticides (which is not how you want to roll anyway, right?). The taproot is king. If you’ve ever grown clones, you might have noticed that they tend to have weaker bases and need more staking than usual. But when you grow from seed, you know you automatically get to enjoy all the benefits of having a taproot. And who doesn’t want more vigorous, healthier, higher yielding, higher-quality plants? Especially when you have an outdoor grow and hit a good groundwater table. Shablam! Yes, thanks to terpenes, you can breed plants to smell like a pine tree, or mangoes, or mint, or musky, etc. But with a passion for breeding, what you may come to love even more is that each seed brings a unique new life into this world. With that new life come boundless opportunities to discover the plant’s full potential, as more scientific research uncovers the full benefits of cannabis–cannabinoids, terpenes, and beyond. 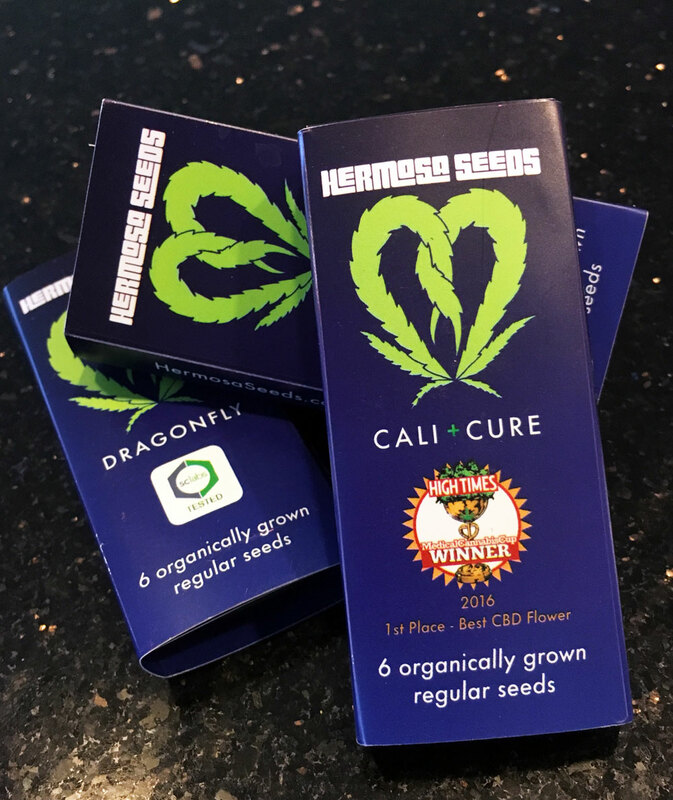 It all started when Hermosa Seeds founder, Vern, became a cannabis patient due to a rare eye condition. Shortly after that, Vern attended the High Times Cannabis Cup in Amsterdam in 2006 as a guest judge. Over these past several years, things really took off when — due to his love of gardening and his love for this particular plant — Vern has had the pleasure of collecting and crossing strains and allowing the plant to unlock more of its limitless potential.